One of the most valuable skills in our economy is becoming increasingly rare. 'Deep work' is the ability to focus without distraction on a cognitively demanding task. Coined by the author on his popular blog Study Hacks, deep work will make you better at what you do, achieve more in less time and provide the sense of true fulfilment that comes from mastery of a skill. In short, deep work is like a superpower in our increasingly competitive economy. And yet most people, whether knowledge workers in noisy open-plan offices or creatives struggling to sharpen their vision, have lost the ability to go deep - spending their days instead in a frantic blur of e-mail and social media, not even realising there's a better way. A mix of cultural criticism and actionable advice, Deep Work takes the reader on a journey through memorable stories - from Carl Jung building a stone tower in the woods to focus his mind, to a social media pioneer buying a round-trip to Tokyo to write a book free from distraction in the air - and surprising suggestions, such as the claim that most professionals should quit social media and that everyone should practise being bored. 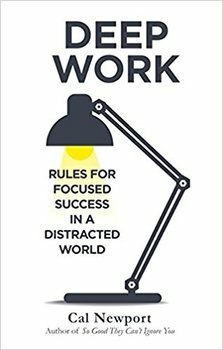 Deep Work will point the way to anyone seeking focused success in a distracted world. Książka zdecydowanie warta polecenia. Rzuca całkiem nowe światło na sprawę rozkojarzenia podczas czynności wymagających skupienia. Bardzo ciekawa pozycja o wpływie dzisiejszej technologii na rozkojarzenie w pracy, wymagającej zwiększonego wysiłku intelektualnego. Zawiera konkretne porady, jak pracować efektywniej i nie dać się pochłonąć otoczeniu pełnym bodźców. Cal Newport explains in a very interesting manner the importance of "deep work" (i.a. laser-like focusing on important task) in today's world. Giving many examples, the author points out rarity, value and meaning of working deep. This is the best, eye-opening non-fiction book I've read this year. After this lecture I pay more attention to what matters most and spend time more wisely! The Bourbon Kings 01 Ward J. R.
Black Dagger 13. The Shadows Ward J. R.
Blood Kiss Ward J. R.
Fallen Angels 06. Immortal Ward J. R.